Universal healing and harmony are the themes of Saint Martin de Porres’s life. He was so in tune with the rhythms of nature and the universe that he was able to heal any sickness, read minds, and converse with animals. To Saint Martin, physical health was essential for spiritual growth; thus, he should be called on whenever wholeness in health or personal relationships are required. Multi-racial himself, he is the patron of racial harmony and invoked whenever racial tensions arise. 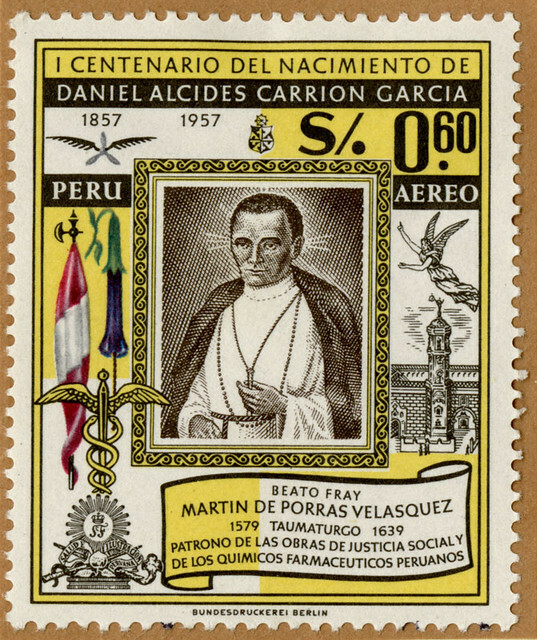 Saint Martin was born in Lima, Peru, just thirty-five years after the conquest of Pizarro. His father was a Spanish nobleman and his mother was a free black woman. Since people of mixed race were reviled, Saint Martin might have been just another social outcast in that country’s history. Instead, he became one of Peru’s national idols. When Martin was twelve he was apprenticed to a barber. In those times, besides being a haircutter, a barber was also a surgeon, doctor and pharmacist. By the time he was eighteen years old, Martin’s reputation as a healer was well established. Rather than pursue his profession, martin kept giving all of his money to the poor. His was a desire to serve God in a state of total childlike humility. He entered the local Dominican monastery as tertiary, the lowest possible level; there he swept the floors and dreamed of being martyred in some foreign mission. Instead, his undeniable talent as a healer became obvious, and he was put in charge of the infirmary. Tirelessly working, he tended to African slaves, the native population, and the Spanish nobility with the same all-consuming intensity. His power to heal any sickness was legendary, and he was so intuitive that his patients swore tha the could read their minds. Stories of his wondrous abilities spread and became more and more elaborate: he was seen walking through a locked door; he was seen in two places at one time; and some said that the could fly from one place to another. Because of Saint Martin’s attunement to nature and its elements, animals flocked to him. He even set up a makeshift hospital to tend sick dogs and cats. Another story has it that he made a pact with the local rats and mice that he would feed them every day if they promised to stay out of the monastery. Each noon he opened the doors of the monastery and fed the poor. No matter how many hungry people were waiting, he never ran out of food. Saint Martin’s holiness and miraculous cures made him famous in his own lifetime. Bishops and learned men routinely consulted him to resolve theological problems. This fame undoubtedly, was the most difficult aspect of his life, since humility and prayer were the most important things to him. Because of his earlier profession, Saint Martin de Porres is also the patron of hairdressers and barbers. In art he is often shown holding a lily for purity and a broom for humility, while standing with small animals at his feet to reflect his closeness to nature. Saint Martin de Porres died of quartan fever in 1639 when he was sixty years old. Immediately upon his burial, miraculous healings were reported all around his tomb site. Saint Martin de Porres, your concern and charity embraced not only your needy brethren, but also the animals of the field. You are a splendid example of charity; we thank and praise you. From above, hear the requests of your needy brethren. By modeling our lives after yours, and imitating your virtues, may we live content knowing that God has looked favorably upon us. Because this is so, we can accept our burdens with strength and courage in order to follow in the footsteps of our Lord and the Blessed Mother. May we reach the Kingdom of Heaven through the intercession of our Lord Jesus Christ. Amen. This entry was posted in Novena, Saints by sandra dipasqua. Bookmark the permalink.